Ulysses Cornelius greets each child with a hug and a peppermint as they enter the gym. He pulls a composition notebook from the side of his wheelchair so each can sign in. It’s the third Saturday of the month, so Cornelius, a 59-year-old double amputee, is teaching karate at the Leroy Moss Community Center in North Columbia where he has volunteered for several years. Double amputee Ulysses Cornelius, 59, volunteers every Saturday to teach karate to local children and teenagers, including one class each month at the Leroy Moss Community Center in North Columbia. That attitude helps Cornelius, a Taekwondo black belt who says he has done karate since he was 8, draw 20 to 60 students to his monthly classes at the gym. They are free, as are the Christian‑infused life lessons that come with them. About 2 million Americans, equivalent to roughly half the population of South Carolina, live with limb loss, said George Gondo, research and grants director at the Amputee Coalition of America. But Cornelius, whose legs were amputated just below his hips, is in rare company, said Scott Sabolich, owner and clinical director of Scott Sabolich Prosthetics & Research in Oklahoma City, the nation’s largest privately owned prosthetic clinic. Health, willpower, age, ability to pay for resources and the extent of the amputation all affect recovery, Sabolich said, and he estimates that no more than 5 percent of those Cornelius’ age who have lost both legs just below the hips return to their normal lifestyles. Cornelius says he thought he would never teach karate again when doctors at Richland Memorial Hospital said the wound from an air conditioner that had dropped onto his foot had become infected. Cornelius spent two years in and out of the hospital. Doctors had saved his life by Thanksgiving 2007, but only by amputating his legs. “If it wasn’t for prayer, I wouldn’t have made it through,” says Cornelius, a 25-year member of Bethlehem Baptist Church who says his faith stems from his Christian upbringing. He says losing his legs was part of God’s plan. “They were his legs anyway,” Cornelius says. 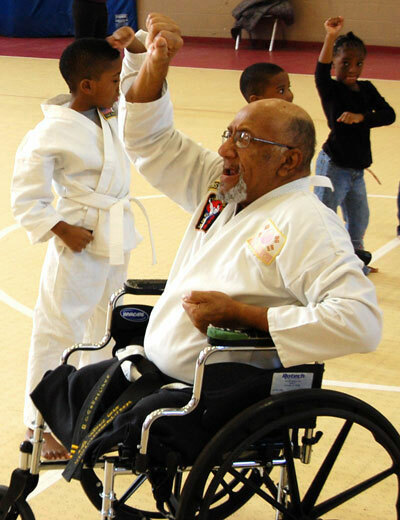 Four months after leaving the hospital, Cornelius was back teaching karate. Soon after, he began teaching the monthly class at the Leroy Moss Community Center, adding it to the weekly class he’s taught at Bethlehem Baptist since 1999. The two-hour class is popular among parents and children, who say it’s fun and uplifting. Cornelius says his faith in God is the only reason he survived the amputation and the two-year battle with infection. In the hospital, Cornelius doubted he would ever teach karate again, but he returned to his class just four months after his release. Cornelius’ pupils, who range from 4-year-olds to college students, marvel at his ability to teach from a wheelchair. And 14-year-old Joshua Brown, who has attended since he was 7, said Cornelius’ dedication and work ethic inspire him to work harder too. After warm-ups, Cornelius teaches striking and blocking from his wheelchair. A few of his best students show others how to do the kicks and other leg movements. But Cornelius teaches more than karate. He stops class roughly 30 minutes early to tell the children he’s proud of them and that they can do anything if they believe in themselves and God. Every class ends with a reading of the 23rd Psalm, which tells of God’s endless love and protection. Martha Brown, Joshua Brown’s grandmother, said Cornelius has a special impact, especially on children with learning disabilities or other handicaps. “I think that him being able to make it himself, he is able to encourage the children that no matter what is going on with you, or no matter how things are at your home or at your school or neighborhood or wherever you are, you can make it,” said Brown, who drives Cornelius to and from his classes. Cornelius has lived off Social Security benefits (PDF) since 2008. Timothy Boyles said he began attending the class in 2009 and that Cornelius became a “grandfather figure,” teaching him how to stand up to bullies at school, but also to be disciplined and use restraint. Listen to Cornelius explain what he enjoys most about teaching karate. Hear Cornelius talk about overcoming adversity and returning to teach karate. Listen to Nasir Gerald describe what Cornelius has taught him outside of karate. Hear Timothy Boyles talk about Cornelius’ compassion. Now one of Cornelius’ assistants, Boyles, who also is a sophomore civil engineering major at Midlands Tech, hopes to help other children the way Cornelius helped him. Cornelius estimates he’s taught over 3,000 students since he started his first karate club in Columbia at age 16, but he still relishes the one-on-one interaction and seeing students’ lives turn around. Cornelius says he wants to get a specialized van so he can get expand his ministry without depending on someone to drive him. He can’t afford it, but that doesn’t quell his faith that it’s on the way. “I know our Father is able to deliver,” he says.